Compass was the superintendent of the New Orleans Police Department when Hurricane Katrina struck. He resigned on Sept. 27, 2005. He is now the chief of security and safety for the Louisiana Recovery School District. This is the edited transcript of an interview conducted on May 19, 2010. "I was basically put out on the front line, the sacrificial lamb"
You've said you were not the normal police superintendent or police chief during Hurricane Katrina. What do you mean by that? Hurricane Katrina was an event that was unprecedented. Normally a police chief's role would have been in a command post, directing from afar. I was at ground zero. I was in the Superdome. I was in the Convention Center. I was in the boats, actually participating in lifesaving missions. We had a situation where the radio system had gone down, so communication was very limited. And it was a situation where things were happening so quickly, and you had to react very quickly, there was no precedent to go by. In many situations you were put in a dilemma, and the definition by very nature of dilemma is the lesser of two evils. I was making decisions on a day-to-day basis as relates to what to do to this, what to do for that. If you send supplies here, then these people will be without supplies. If you send troops there, these people would be without troops. You send the boats here, these people will be out [of] boats. So it was a very daunting task which I had to take as the superintendent of police. Did I make mistakes? Definitely. But the mistakes I made were mistakes of the heart, not mistakes to try to hurt anyone. It relates to dealing with the media. I was put in a virtual no-win situation. Why do you think your interactions with the media were a no-win situation? It was a situation where communication was very limited. There was a lot of rumors. I spread a lot of rumors. But if I wouldn't have gave the information that was given to me without being verified, then I would have been accused of covering things up. So it was a no-win situation. I was basically put out on the front line, the sacrificial lamb, for lack of a better term. Officers were reporting gun battles to me with no specifics -- no specific locations, no specific names of officers. They were reporting this thing to me, these things to me in front of the news media, because, you understand, I didn't have any office; the media was all around me. So when people were reporting things to me, the media heard the officers reporting these things to me. So if an officer reported to me about a shooting that may have taken place uptown, and the media asked me about the shooting, [and] if I said a shooting didn't happen, then they're going to say, "Well, we just heard a police officer tell you about the shooting." Even though I didn't have any names, I didn't have any specific locations, I didn't know if there were any injuries -- all I got was information about a shooting, and I reported that without it being verified. Then I was accused of being reckless. But had I not reported that and [it had] later been found to be true, what kind of coverup is the chief involved in? When the rapes were reported to me, I reported that. There was no crime scene; there was no way to find out the victims, find out perpetrators. You couldn't have a crime lab because there was no way from a logistics standpoint. So you believed that babies were being raped? Well, that was reported to me. That's the things that were reported to me -- and women were being raped. Now, after the hurricane was over, women came back and said they were raped in the Superdome, after they got to their final destination, after they were evacuated. Now, suppose I had not reported those things. The first thing they would have said is the chief was covering up the rapes. So you see, I couldn't win. In hindsight, I should have had two press conferences, one in the morning [and] one in the evening. I shouldn't have talked to the media during the day. That was my bad. I would check and double-check information before I would disseminate it. I was so afraid of covering anything up or being accused of covering something up, I gave out all the information before I really vetted through it, and that was my mistake. But you've got to understand the circumstances. I was up 22, 23 hours a day. I wasn't getting a lot of nourishment. I was making life-and-death decisions. My public information officer, [Paul Accardo], who I was very close to had committed suicide 30 minutes after I spoke to him. My wife was eight months' pregnant. I didn't really know where she was. My aunt and my uncle was missing. My family wanted me to drop everything and go look for them. I couldn't use my power as the chief of police to use our resources for my personal well-being. My aunt and uncle were found drowned because I didn't go look for them. I live with that to this day. Many members of my family still hold a grudge against me for not using my power and my position to go look for my own family members. So these are the type of decisions I had to make on a daily basis. What is that like, when you're watching scores and scores and scores of people die, and their lives are in your hands, that you have the power to save them or not save them, and it's hanging on you? How do you deal with that? Well, the ones that we can save, we save. It was a very daunting task. It was a lot of pressure on me, and I think I did the best that I could under the circumstances. I was there with my troops. Now, 20 people went to patrol that Superdome with the number of people in there and the violence that was being reported. So it was just a daunting task just actually trying to keep it all in the Superdome. And then once we evacuated the Superdome, we had the Convention Center. Think about 20,000 to 30,000 people in a confined area where the bathrooms had been overwhelmed, so people were urinating and defecating in the hallways. People who were sick were throwing up all over. Women didn't have sanitary napkins. Babies didn't have diapers. There was very limited food, very limited water. I was out there dispersing the food and the water. I walked through the crowd giving out the water. I was inundated by people wanting me to give them water. I was giving the water to the small kids and to the older people. That's a decision I had to make. Men and women in their 30s and 40s say: "Well, I'm thirsty. I'm hungry, too." I can understand that. But I've got to feed these children first. I've got to feed these old people first. That's decisions I had to make, which weren't popular decisions. It wasn't easy decisions. These are the things that I took upon myself as the superintendent of police to do. What were you thinking when you saw the waters rising on the 29th of August? You're getting reports that your officers were trapped in their houses, that people are dying in large numbers and people may die. What's going through your mind at that point? I'm saying we have to try to get some boats, because we know we have to do rescue missions in the water, and Capt. Timmy Bayard, he was right on. He and I basically came up with a plan to break the city up into grid maps. Once the water rose, there were no street signs you could see, and people couldn't get around, so we commandeered boats, private vessels; people donated boats. I got up in a helicopter, and I was actually spotting for the boats, because you had to come up with a route where they wouldn't hit a dead end. So these are the type of plans that we put in place instantaneously. The two chiefs that I dealt with directly, [Deputy] Chief [Daniel] Lawless and [Deputy] Chief [Lonnie] Swain, we basically was just trying to get the job done. It seems like come Aug. 30, things changed. That was when Officer Kevin Thomas was shot. 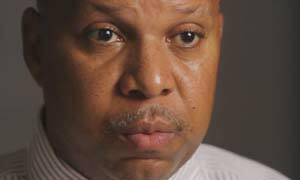 There are some who say that you told Mayor [Ray] Nagin: "Officer Thomas has been shot. It's rough out there at the Hyatt." And then Major Nagin says, "We need to declare martial law." And then later on that day, he takes people off search and rescue and moves them to stopping looting. I don't really remember that. Search and rescue was my number one priority. Even if he would have said that, I wouldn't have taken my people off search and rescue to stop the looters. That was basically physical merchandise. My number one priority was to save lives. I'm not saying he didn't say it. I don't remember him telling it to me. Maybe [he said it] to Chief [Warren] Riley. The command may have been fragmented. What was your sense that the command structure was kind of fragmented during those days? I was dealing with Chief Swain and Chief Lawless on an hour-by-hour basis. Chief Riley and [then-Deputy Superintendent] Chief [Steven] Nicholas were dealing with the operations aspect. We didn't have a lot of communications between us, but my number one priority was getting people out of the Superdome. Chief Swain was at the Superdome. That's where I spent most of my time. Once we evacuated the Superdome and got people medical attention at the Superdome, we moved to the Convention Center. Chief Swain moved with me so we could come up with a plan to evacuate the Convention Center. Chief Lawless was involved in logistics coordination with people in city government at City Hall. I saw Chief Riley, but we didn't really communicate a lot because I was dealing with the pressing matters at hand. Did you ever hear about him putting out a directive to stop the looters? I didn't really hear that until after I was forced to resign. So I'm not saying it didn't happen; I'm not saying it happened. I don't know, so I can't really comment on things I really don't know. Some have said that Mayor Nagin, around the 30th, said: "We're going to declare martial law. It's martial law now." Do you remember about that? I really can't remember hearing that. Like I said, I was so focused on saving lives. I was so focused on dealing with people that was sick. There were thousands of people in need. I was in a situation where the media was focusing on every word that came out of my mouth. Paul Accardo, a public information guy, wanted to talk to me. I told him I didn't have time to talk to him. Thirty minutes later he committed suicide. That haunts me to this day. Unfortunately, the officer reported to me, in front of the media, that Officer Accardo committed suicide, so they saw me crying. So people thought I was breaking down constantly. Nothing could be further from the truth. I was strong during that hurricane. I made some tough decisions, and I was out there with the men and women and the citizens of my city trying to help. People who were really here, people who really know, they'll tell you the same thing. I can't protect myself from people who try to vilify me and second-guess every decision I made. Talk about some of those heroic acts that stand out in your mind of officers who went beyond the call to help their fellow citizens. They saved thousands of lives in these boat missions. Just going out there in that water, pulling people off of roofs, getting sick people medical attention, feeding people that were hungry, these were the things that was being done by the officers of this department on an hourly basis. But it was overshadowed by the people who wanted to focus on negative things. So when the looting and the thievery started, that was never a focus for you? [Not] for me. And it was only such a small number of individuals doing that. What about the kind of shootings and the gun battles that culminate on Sept. 4 with the Danziger Bridge incident? I can't comment on the Danziger Bridge because it's under federal investigation. I didn't know about the incident until after I wasn't the superintendent of police anymore. Chief Riley was the chief of operations. The investigation was done entirely under [his] watch. Those officers were under his auspices, and he never reported to me about the incident, because I don't think he really knew. It was a situation where it was not brought to either one of us, so there was no way I could have known. So there's nothing I can comment on. When you started seeing the things in the newspapers about the Danziger Bridge incident, and when you see the guilty pleas come down from the former officers, how does that make you feel? It saddens me that human life was taken and that so many people were hurt. And what do you think about the revelations from officers saying, "We conspired to cover up these shootings," "We planted a gun there," "We made up stories"? Well, it's a sad situation is all I can say. I knew nothing about it. Obviously it's something that shouldn't have been done, that's for sure. What do you think now of the federal involvement coming in and saying we are going to work on the civil side to restructure the police department? I've been gone from the police department so long that I don't know what happened. Once I was forced to resign, that was it. My affiliation with the New Orleans Police Department was totally over. Chief Riley and I are not personal friends, so we didn't spend any time together. We didn't discuss the police department. What were three things that you wanted to do to improve the force that you thought needed to be done while you were there? Oh, more than three things. We did a lot. I wanted to be more transparent. I wanted to make crime go down. I wanted to make the murder rate go down. I wanted to be more in touch with the community. I wanted to bring the ministers in, because they are a very powerful resource. They are so respected in the community that we formed a strong relationship with the clergy of the city [so] that we could solve a lot of our problems. I wanted to build safe havens within each church where our kids could go and be mentored, where they could do their homework, where they could get Bible study. One thing I never saw [was] a kid hurt in church or the library, so I figured if we kept the kids in churches and in libraries, the chances of them getting in trouble would diminish tremendously. You don't think about crime fighting as purely a law enforcement concern; you think about this as a systems issue. Tell me about that. I think when we have to make a physical arrest, it serves us no purpose, and it serves the community no purpose. I say that because when you arrest somebody, then it costs thousands of dollars to incarcerate, thousands of dollars to go through the criminal justice system. [Were we to] take some of those monies and put it into preventive programs where we mentor kids, or we deal with the social ills before it [comes] to the point where the kids actually grow up to become criminals and learn criminalist [sic] behavior, we would get a better result from our resources. [If] you look at the criminal justice system, we've been putting people in jail for a long time, but crime is still rampant; the murder rate is still high. You have to deal with the actual root causes of the problem: poverty, lack of education, lack of male role models. So you have to present these kids with hope, with alternatives. And I did everything I could humanly possible as superintendent of the police to reach out to those kids. In the long term, what do you think it takes to reduce the homicide rate? What steps can the New Orleans Police Department take to bring it down? Well, I think [Chief] Ronal Serpas is making the first steps. He's bringing the community into the crime-stop process. He's showing the community the actual problem. Like with alcohol, before you can recover, you have to admit you have a problem. Well, the community is admitting they're having a problem, so the first step is being taken. Now, you have to take that momentum to incorporate the community and the solution. And it's a holistic approach. You have to have people committed to hiring kids with criminal records, to give them alternatives. You have to have businesspeople hiring ex-offenders when they get out of prison so you don't have to go back to criminal behavior, which takes a large commitment on the entire community. Is an early warning prevention system the kind of thing that you think might be an improvement, something that could flag troubled officers? Well, we had an early warning system when I was superintendent of police, but an early warning system is something that's really necessary to identify officers who may be in need of some type of intervention. When you were the chief, was it hard to really deal with problem officers? Well, I looked at it from a perspective where the system is in place for the protection of the officers and the protection of the community. I followed the rules of civil service, and I did everything we could humanly possible to do our due diligence to address officers who were infringing on the rights of our citizens. And those individuals we took off the street. Those individuals we fired. It's incumbent upon internal affairs to do a thorough investigation and do their due diligence. Each circumstance is different, and you do what you can. Were you happy with how the discipline and internal affairs process was working when you were the boss? We did what we could. You're never going to be completely happy, but it was a system that was in place, a system we had to work with. People will say, look, there's a lot of good officers on this force, but there's also been a lot of problem officers over the years. They'll say the federal government has taken a look at this department three times now, and maybe earlier they should have stepped in and worked with the department to reform it. What do you think about that? When you talk about an organization that has 1,600 to 1,700 employees, you're going to have some bad apples. Unfortunately, when you're dealing with police officers, they're a high-profile position. They are in the limelight, so it's going to be brought to the attention of the community when nefarious acts are committed by a police officer. There are far more good police officers than bad, but unfortunately the bad apples get all the press. Hopefully Chief Serpas can weed out most of the bad apples and get the department back on the right path. How do you think the department evolved between the era when Richard Pennington was the superintendent [1994-2002], the era when you were the superintendent [2004-2005], and Warren Riley was the superintendent [2005-2010]? Between Pennington and I, we still kept the things in place as it relates to accountability. Chief Pennington did an outstanding job on bringing the department into accountability. The difference between me and Chief Pennington [is] I was more accessible to the community because I went to a lot of community functions, but just by me being from the city, but he did a great job as it relates to getting the police department in the right direction. I tried to continue that. What about the discipline, the internal affairs reviews, that kind of stuff that Chief Pennington set up? We kept those things in place. About Chief Riley I don't know, because I don't know what he did, what he didn't do. We didn't keep in contact. We didn't talk about those things. There's a revelation that's come out in the Danziger Bridge case, a story in the court papers about an officer giving out something called a "ham sandwich," a gun to plant at the scene of the crime. Did you ever hear anything about that? Nope. That's not on my radar. Nothing about that. Like I said, that investigation was done under Chief Riley's watch. I don't really recall having those type of conversations. I'm telling you straight up. I don't know. I don't know. Well, I didn't know. I was at the Superdome. I was at the Convention Center. This happened in New Orleans East. The officers obviously didn't want us to know. So if they don't report it, they don't tell me, how would I know? Like right now you're sitting here talking to me. If somebody shoots somebody in New York where you're from and nobody calls you and tells you about it, and it's a relative of yours, and so I say, "How could you not know your sister's been shot? How could you not know? Didn't nobody call you and told you?," is it your fault you didn't know your sister was shot? It's your department. Shouldn't somebody have called you or come to see you? Well, if the individual [who] is involved in the shooting didn't tell anyone in the chain of command, how would the lieutenant tell the captain, the captain tell Chief Riley, and Chief Riley tell me if it didn't get that first step? I was way on the other side of town. Chief Riley was chief of operations; he didn't know. So if he didn't know, how would I know? Some people say this stuff didn't get investigated because Chief Compass said, "Hey, if there's a shooting, if there's a serious incident, just write up a short [justification report], write up a short report saying necessary action taken." You've got to understand, there were no computers; there was some people [who] didn't have pencil and papers. An officer called the dispatch and asked what to do in a shooting if they can't get the proper units out there because of the communication problems. I basically said write a report justifying the incident; send it through the chain of command so it can be documented and codified. What more could I do than that? I wouldn't tell anybody not to write a report. That's crazy. But you've got to understand, it would be so difficult to get Crime Lab to take fingerprints, to take pictures when you've got people scattered all over the city trying to save lives. Did you say write a brief report? No, I didn't say write a brief report. I said write a report with all the facts and circumstances and send it through the chain of command, ... and then we could do a further investigation once the resources came up. I directed officers to codify and report these incidents to the best of their ability. Now, what was the best of their ability at the time? I don't know because I don't know what the limitations of each officer [were]. I was doing everything I could humanly possible to document this stuff. What more could I do as the superintendent of police? There is a scene that you talk about from the Katrina time period of having to go from rescue mode to tactical mode. Do you remember that? We were going in and out. If you're in a rescue mode and you're trying to save someone, and then all of a sudden somebody will start shooting at you in the boat, you have to go from trying to save lives to trying to defend yourself and defend the people that's in the boat with you. That was a really unique situation. The people that were shooting, maybe they were shooting to get your attention. Maybe they were shooting because they were trying to get you to come and save them, but at that time you didn't have that luxury knowing what they were shooting for. And these are the type of instantaneous decisions you had to make. When people were saying that we were exaggerating, it wasn't that we were exaggerating. We were reporting what was being reported to us. And in hindsight, sitting and thinking about it, maybe those people that were shooting weren't shooting at us. They were shooting to get our attention.